The previous instalment, RUROUNI KENSHIN: KYOTO INFERNO opened in Singapore on 28 August, and is the highest-grossing Japanese film this year. Warner Bros. Singapore has unveiled six exciting new character posters for RUROUNI KENSHIN: KYOTO INFERNO and RUROUNI KENSHIN: THE LEGEND ENDS! 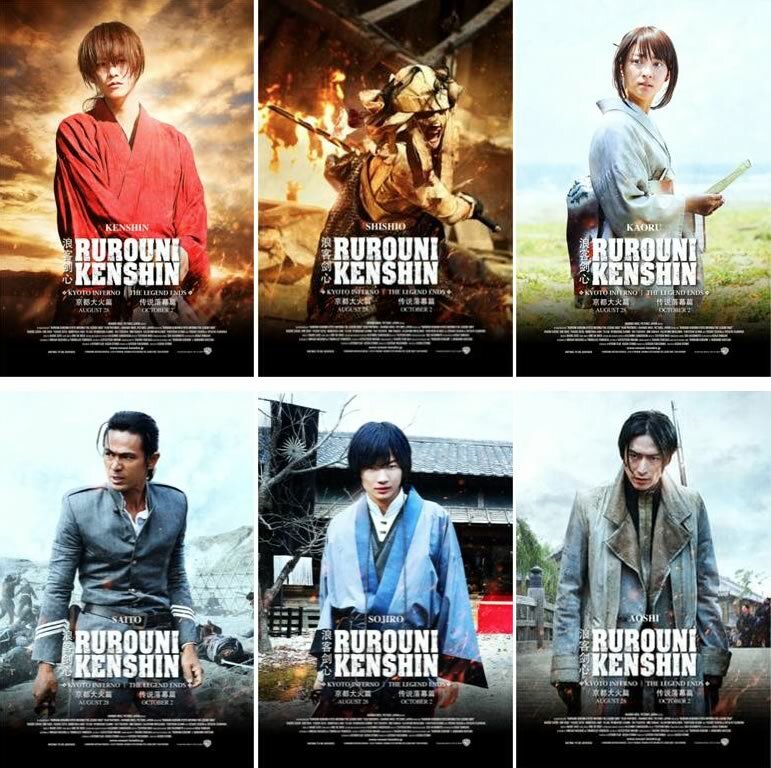 Based on Kenshin the Wanderer: The Romance of the Meiji Swordsman (Shueisha Jump Comics), a popular manga series which has sold more 5.8 million copies, RUROUNI KENSHIN: KYOTO INFERNO is the follow-up to the first Rurouni Kenshin motion picture in 2012. In KYOTO INFERNO, Kenshin faces a new foe in the form of Shishio – a man betrayed by the government now seeking to overthrow the new regime. RUROUNI KENSHIN: THE LEGEND ENDS will open shortly after as the final conclusion to the Kenshin trilogy. You can download the high-res versions of these posters on our Facebook page. Based on Kenshin the Wanderer: The Romance of the Meiji Swordsman (Shueisha Jump Comics), a popular manga series which has sold more 5.8 million copies, RUROUNI KENSHIN: KYOTO INFERNO is the follow-up to the first Rurouni Kenshin motion picture in 2012. In KYOTO INFERNO, Kenshin faces a new foe in the form of Shishio – a man betrayed by the government now seeking to overthrow the new regime. RUROUNI KENSHIN: THE LEGEND ENDS will open shortly after as the final conclusion to the Kenshin trilogy.